Grandmaster Harley Reagan was a 10th Degree Red/White/Black and Gold Belt, and is the Founder and Soke of the American Indian Fighting Arts Association (Chulukua-Ryu system); a 10th-Degree Red/White/Black Belt and Director of U.S. Hombu ("main school") in Shorinji-Ryu Jiu-Jitsu; a 10th-Degree Red/White/Black Belt and Director of U.S. Hombu in Shorei-Ryu Karate; held high ranking Black Belts in 14 martial arts; and was a Marine Corps Veteran. Grandmaster Harley Reagan started learning Judo when he was 8 years old, and became a highly accomplished martial artist, including being chosen as an alternate member for the 1964 United States Olympic Judo Team, and holding the title of World Jiu-Jitsu Champion from 1967-1970. His achievements have received worldwide recognition as the recipient of the Golden Life Achievement Award from the World Martial Arts Hall of Fame, and his induction into the World Sports Medicine Hall of Fame, both in 1994. 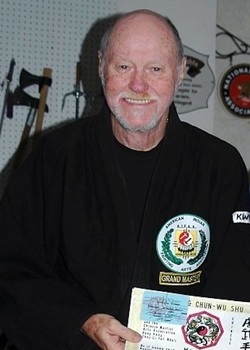 Grandmaster Reagan had over 50 years of practice and teaching in the Martial Arts. Currently his students are registered and belted through Ten-No-Kishi Dojos.